Sunday, August 13, 2006, 7:00 p.m.
Join Youth for Asian Theater for an evening of original plays and monologues written, directed, and performed by San Francisco youth. “From This Day Forward” written & directed by Alice Li. Would you rather spend time with the hottest guy in school, or study physics, work out and read Hemingway? “Chawee and da Fortune Cookie Factowee” written & directed by Sunshine Roque. An inspiring story of a young child with a passion for fortune cookies. “Normality” written by Katherine Mar, directed by Amy Chow and Katherine Mar. When the boss invites herself over for dinner, Maye frantically attempts to mold her family into a normal one. “Once Upon a Dream” written by Evelina Vu, directed by Elizabeth Chan and Evelina Vu. 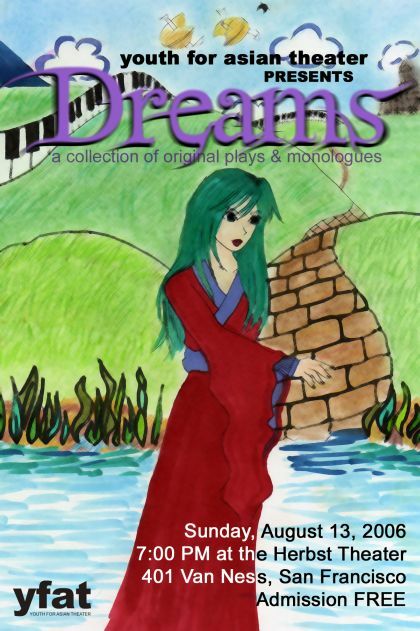 A self-conscious girl faces her real problems in her dream world. “Another Autobiographical Story” written & directed by Laura Fong. A high school senior struggles to choose between her desires and her parentsEexpectations. “Guess Who’s Coming to Dinner” written & directed by Samantha Eng. Jenna tries to introduce her boyfriend to her highly demanding parents. “My Dear Salvatore” written by Samantha Eng, directed by Jessica Repas. How far will a girl go in order to purchase a $15.99 pair of Salvatore Ferragamos? Featured monologues written by Tony Dear, Samantha Eng, and Connie Zhang. Youth for Asian Theater is a student-run organization that raises awareness of cultural identity and youth issues through the performance arts. Now in its sixth year, YFAT operates through the passionate efforts of its cast and crew members as they bring the script and stage together. Since YFAT’s beginning, the members spent eight weeks every summer rehearsing at the Sunset Recreation Center of the San Francisco Recreation and Park Department. Company also includes: Amanda Arenas, Takeshi Atwater-Kaji, Michelle Chang, Yessenia Chiau, Jessica Chin, Nathan Dizon, Katrina Harvey, Vincent Lee, Ching-ching Liu, Rebecca Morita-Hidalgo, Angela Ngai, Kristine Reyes, Wilson Szeto, Clarence Tse, James Wong, Nathaniel Wong, Victoria Wong, and Celine Wu.